• Arms drop independently below seat level for safe lateral transfers. • Easy-to-release drop arm mechanism may be operated by patients lacking manual dexterity. • Arms automatically lock in raised position. 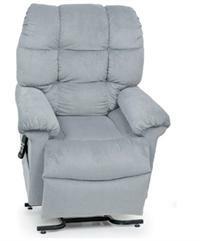 • Watertight, heat-sealed padded seat is easy to clean and comfortable. 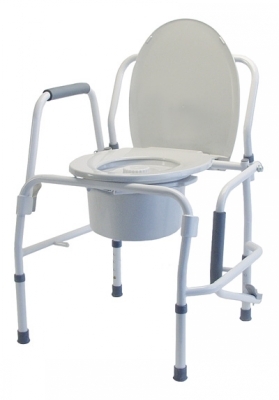 • May be used as a bedside commode, raised toilet seat or toilet safety frame. • Welded steel construction increases strength and stability. 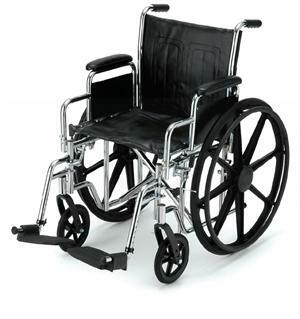 • Chrome-plated steel frame is scratch resistant and easy to clean. 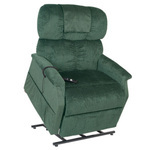 • Cushioned armrests enhance user comfort. • Seat height readily adjusts from 19 ½" to 23 ½", in 1 inch increments. • Comes complete with commode pail, cover and splash shield. • Designed to meet the requirements of HCPCS code: E0165. • Limited lifetime warranty.